Santa Cruz beaches make this Bay Area city the perfect destination for a beach trip or a beach vacation. 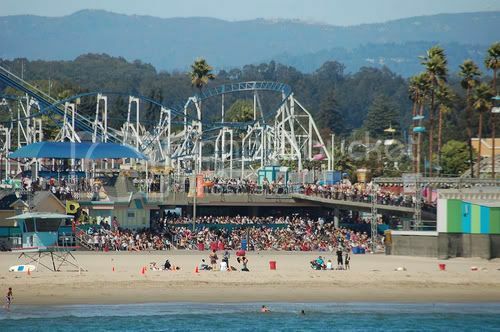 The famous Santa Cruz Boardwalk and amusement park provides fun for the entire family, and the beach next to the Boardwalk is clean and well-kept. Surf shops, restaurants and oceanfront hotels huddle around downtown Santa Cruz, and there is enough to do and see to fill several days of vacation, especially if you enjoy “funky stores” and the vibrant Santa Cruz “music scene” — all within walking distance of the beach. If you travel south on Rt. 1 from Santa Cruz beaches, you will find other offerings in Capitola (which has a nice beach next to the wharf with nearby restaurants and free parking) and two pristine state beaches, Seacliff State Beach and New Brighton State Beach. Continuing south into Monterey County, it’s just one long white beach — easily accessible from Beach Drive — with free parking and beachfront amenities galore. If you are a surfer, the Santa Cruz area will likely provide the best rides in this part of California. West Cliff Drive, on the west side of the Santa Cruz Harbor, has a breakwater which converts the prevailing surf into extremely ride-worthy waves, and surfers can pick up unusually high waves which run for hundreds of yards before either breaking or dissipating into Santa Cruz harbor. While this is technically a rocky coastal area and not really “Santa Cruz beaches” in the purest sense, surfers can walk down stairways to enter the water safely from several spots on West Cliff Drive, and non-surfers can observe the action from Lighthouse Field State Beach at the end of West Cliff Drive. Heading north from Santa Cruz, traveling up Rt. 1, you pass miles of undeveloped coastline, coastal farms and several unmarked roads that take you down to wonderful, pristine beaches, most without any amenities. A favorite Santa Cruz County beach is Bonny Doon in Davenport, CA. Parking is easy, right along Rt. 1, and the beach is lovely and totally isolated. A few things to note: (1) because of the isolation Bonny Doon is popular with naturalists; (2) it’s unwise to leave valuables in your car when parked here; and (3) this part of the coast is often foggy, cold and even if it’s warm swimming is not recommended. Still, it’s a gorgeous beach and well worth a stop. As you travel further north toward Half Moon Bay, you’ll pass Pigeon Point Lighthouse, Pescadero State Beach and Martin’s Beach. Half Moon Bay is a seaside town with a wonderful state beach, coastal trail, campgrounds and several oceanfront hotels, inns and lodges — everything from the palatial Ritz Carlton resort to some less expensive lodging choices. There are also some wonderful restaurants in Half Moon Bay and nearby Moss Beach, many of which source their food from the local farms and fisherman. Moss Beach, by the way, has a more compromised access to the beach itself and offers more of a “retreat” than a beach experience. Surfers who have made their way up from Santa Cruz beaches will probably want to stop at the famous “Mavericks” surfing area on the north side of Half Moon Bay, although they may not want to surf there. During winter storms, especially, the surf at Mavericks can be extremely very challenging and dangerous. Photo of Santa Cruz Beach Boardwalk Amusement Park by Donnaphoto via flickr (Creative Commons).